DO YOU KNOW YOUR GAY RAPPER?! 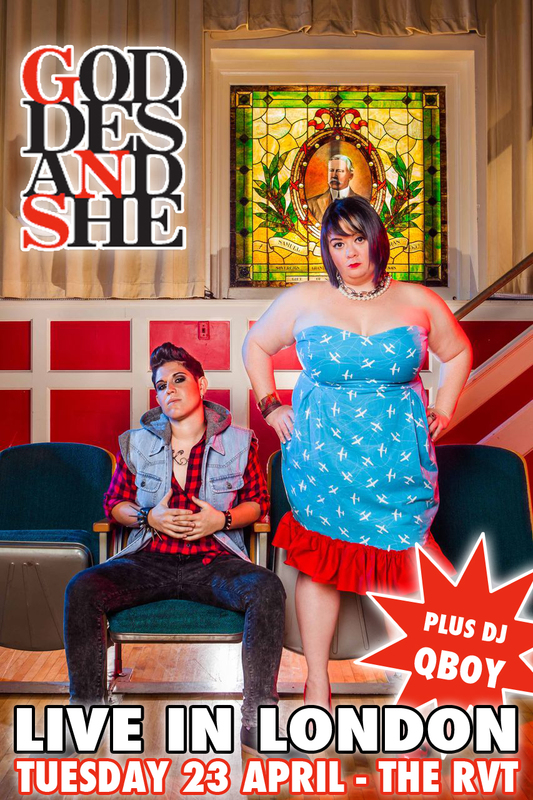 US hip-hop dykes with mics God-Des and She are performing in London tonight and with so many hot and happening out gay rappers we thought we'd give you the low down on who's who and some of our favourite artists and bands. With a 15 week run at MTV LOGO's number 1 spot under their belt with 'Love You Better', it's not surprising that God-Des and She are in this list. Singer She brings the soul, God-des provides the rhymes, and unapologetically they rock the mics as only queens can. First seen on hit show The L Word, they have since shared the stage with artists including Lady Gaga, Salt-N-Pepa and SIA. One of the newest on the block but by no means the least, this rapper has got flow, rhymes and isn't scared to show it on his mixtape "The Eulogy" sporting the freshest of beats and the gayest of samples. He is touring Europe this summer with a London date to be announced soon so keep your ears open and your eyes peeled! Check out "CUNTSPIRACY" here. Trans rapper, artist, performer Mykki Blanco has taken the world by storm the past 12 months. Touring with tracks from his "Cosmic Angel: The Illuminati Prince/ss Mixtape", it is his slick video "Wavvy" that got the worlds attention. Evon 'the music bully' has been leading the homo-hop movement in London for some time now with her very own blog 'LGBT Underground.com', helping other artists, creating a supportive community, and spreading the news. She was also one of the first artists to perform at London's queer hip-hop festival 'PeaceOUT UK'. Here is her video for "Been Around". Cazwell started off in a group called Morplay with lesbian rapper Crasta-Yo back in 2000 but quickly became the face of gay rap with his cheeky rhymes ("I seen Beyonce at Burger King") and music videos crammed so full of naked boys that it would make a whore blush, never better demonstrated than on his hit "Ice Cream Truck"
The UK's first gay rapper not only raps, performs and produces but also created queer hip-hop festival 'PeaceOUT UK' and as a DJ promoter he runs several successful gay hip-hop parties including 'R & She' and 'Put It In Your Mouth'. His groundbreaking Channel 4 documentary 'Coming Out To Class' also helped LGBT teens experiencing homophobia in school. This MTV LOGO top 10 hit "Coming Out 2 Play" features She (God-Des and She). This New York artist has captured the hearts of the fashionistas with his very unashamed flow stance and style. You cannot argue with over 1 million views on youtube from his track "Wut" - so go add some more. Drawing from New York's old school voguing legacy, Mr Katz achieved viral status with his video "I'mma Read" which placed him as the support act on tour with Azealia Banks. Fashionistas love Zebra 'F**kin' Katz! Originally formed of lesbian rappers Shunda K, Shon B and vocalist Jwl B, and hailing from Baltimore, USA, they created a new punk hip-hop sound mixing crunk and electro club sounds. They entered the charts and the mainstream in 2009 with their hit 'Don't Let Go". The all dancing all rapping LA based stylist AB Soto, provides the most dazzling and impressive live performances and has captured the hearts of every person who sees him. Colourful crazy and cocky, his music videos and short film "That's FASHIONZ" keep him in the spotlight. Check out "Keep It Movin". Nicky Da B hails from New Orleans and his music reflects the 'Bounce' style that was created there. One of the first gay rappers to be picked up by a major mainstream artist, his vocals feature on Grammy nominated producer Diplo's track 'Express Yourself". You can catch God-Des and She perform LIVE in London this TONIGHT (Tuesday 23rd April) at The Royal Vauxhall Tavern, with DJ support from QBoy.